SHOP.RCCOLLECTIBLES FOR ALL YOUR COLLECTIBLE NEEDS! 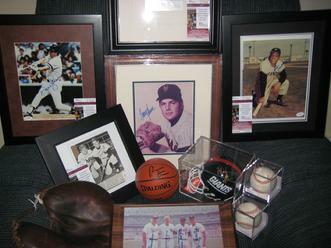 RC COLLECTIBLES ONLY SELLS 100% AUTHENTICATED AUTOGRAPHS AND MEMORABILIA FROM THE TOP AUTHENTICATION COMPANIES IN THE HOBY. FOR MOST OF OUR AUTHENTICATION NEEDS RC COLLECTIBLES HAS CHOSEN TO FOLLOW THE LEADER GIVING JAMES SPENCE AUTHENTICATIONS (JSA) OUR THUMBS UP! ALL OUR PRODUCTS COME WITH OUR 100% GUARANTY. LOCK ON THE LINK AND START WORRY FREE SHOPPING NOW. CHECK OUR STORE INVENTORY AND SPECIALS FOR UNIQUE AND UNUSUAL COLLECTIBLES. AT ANY GIVEN TIME YOU WILL FIND EVERYTHING FROM STARTING LINEUPS , VINTAGE NEWSPAPER FRONT PAGES, TO COLLECTOR PLATES AND STAMPS. LARGE CATALOGUE OF VINTAGE AND NEW SPORTS CARDS AS WELL AS NON-SPORTS CARDS. IF YOU DO NOT SEE WHAT YOU ARE LOOKING FOR PLEASE CONTACT US TO CHECK OUR OFF LINE INVENTORY. FOR ALL YOUR COLLECTIBLE NEEDS!